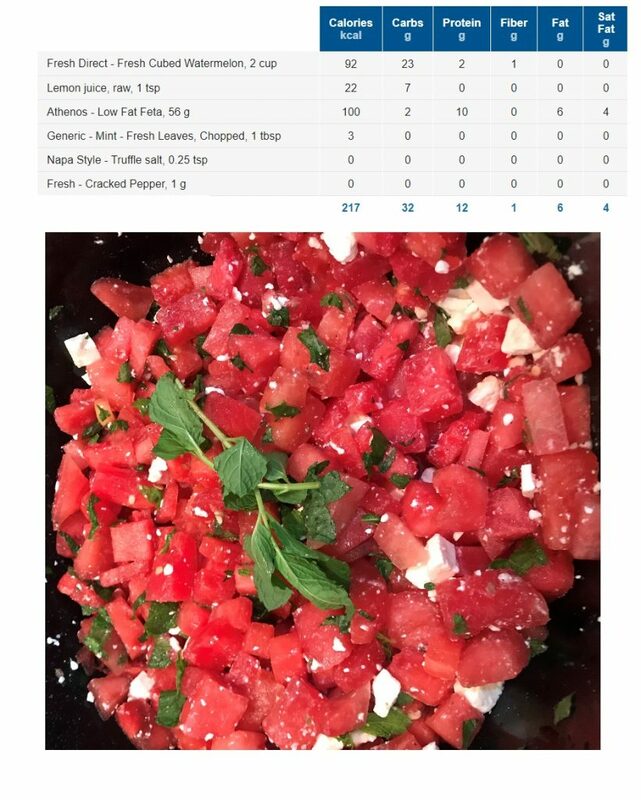 I made this simple, low-calorie salad the other night and wanted to share it. (The amounts are just estimations; I did not measure the ingredients as I was not following a recipe.) You can adjust the ingredients to fit your nutrition plan. I think diced Vidalia onion and maybe Kalamata olives would add a little more depth to the salad, as would some balsamic vinegar and olive oil. You could also really boost the protein and lower the calories by using fat-free feta cheese (2 ounces comes in at only 70 calories with 14 grams of protein), though for some the taste of nonfat cheese makes the swap not worth it. 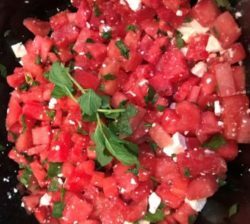 Incidentally, watermelon is a great example of something that is high on the glycemic index and low on the glycemic load.